The dime coin has been in circulation since 1796. Dimes made before 1964 have a base value of the current price of silver. The most valuable dimes are measured by such standards as condition, rarity and date of the coins, and can be worth in excess of $2 million. Barber dimes were minted from 1892 to 1916 and were designed by Charles E. Barber. The 1894-S Barber dime is one of the rarest coins in the world, with only 24 made and nine known to be in circulation. In 2007, an 1894-S Barber dime sold for a record $1.9 million. The dime has a slightly copper tinge. The observe (heads) side of the coin features a bust profile image of Lady Liberty with garland leaves around her head. The reverse (tails) side has a darker appearance with less copper hues, and features the words "one dime" in capital letters stamped in the middle surrounded by a decoration of wreaths. 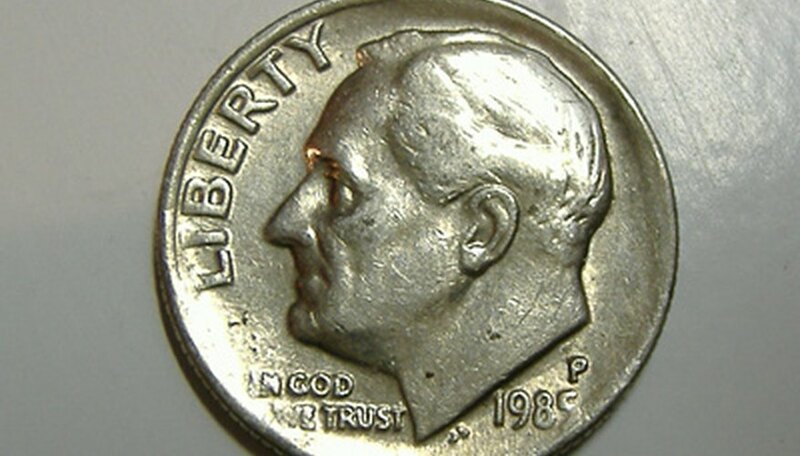 President Franklin Roosevelt's face adorns the obverse side of the Roosevelt silver dime, minted from 1946 to 1964. In 1965, silver was no longer used in the production of the dime, replaced by copper and nickel. There were a handful of silver dimes minted in 1965 in error, and these coins can be worth $9,000 or more due to their rarity. A 1965 Roosevelt silver dime has a silver edge, whereas the normal dime has a brown edge. The silver Roosevelt dime has a weight of 2.5 grams, compared to 2.27 grams for the copper and nickel dimes. Liberty Seated dimes were minted from 1837 to 1891. The obverse side depicted Lady Liberty holding the torch in her left hand while sitting on a rock. The reverse side featured the words "one dime" surrounded by decorative wreaths. In 1996, an 1873 Liberty Seated dime was sold at auction for $550,000. This 1873 coin was part of a rare group of dimes that did not feature arrows at either side of the stamped date which indicated a weight increase in the silver content. Because of this rarity, "no arrow" dimes are especially valuable for collectors. The 1873 Liberty Seated dime had a .900 silver content, .100 copper content, a diameter of 17.9 mm and a weight of 2.49 grams. The 1873 Liberty Seated dime has a listed value of $2.69 million as of 2010. The draped bust dime was minted from 1796 to 1807, and was the first 10-cent coin made for general circulation in the United States. The draped bust dime's reverse side depicted a small eagle perched on a cloud, and the obverse side featured a profile bust image of Lady Liberty with flowing hair and a gown draped around her right shoulder. A 1796 draped bust dime in very fine condition sells for $6,700 on eBay in 2010.